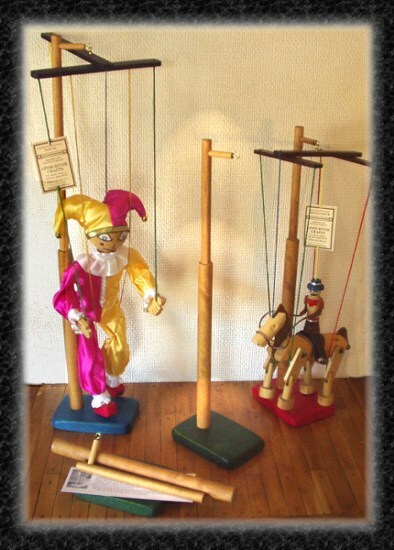 Our Display-stands enhance the marionettes in ways that are both practical and aesthetic. First, they offer a perfect answer to the question of how to keep and display the marionette. Then, in addition, they turn this animated wooden sculpture into a handsome display piece when not in use. Constructed of hardwood, the 4” x 6” bases come in a variety of lustrous, transparent colors. With it's '3-part' design, the Display-stand ships easily and comes with instructions for easy assembly WITHOUT TOOLS. The Display-stands are offered as an option with the Marionettes. Or they may be purchased separately. Includes Free Shipping to 48 States! I understand that this purchase may not be returned.